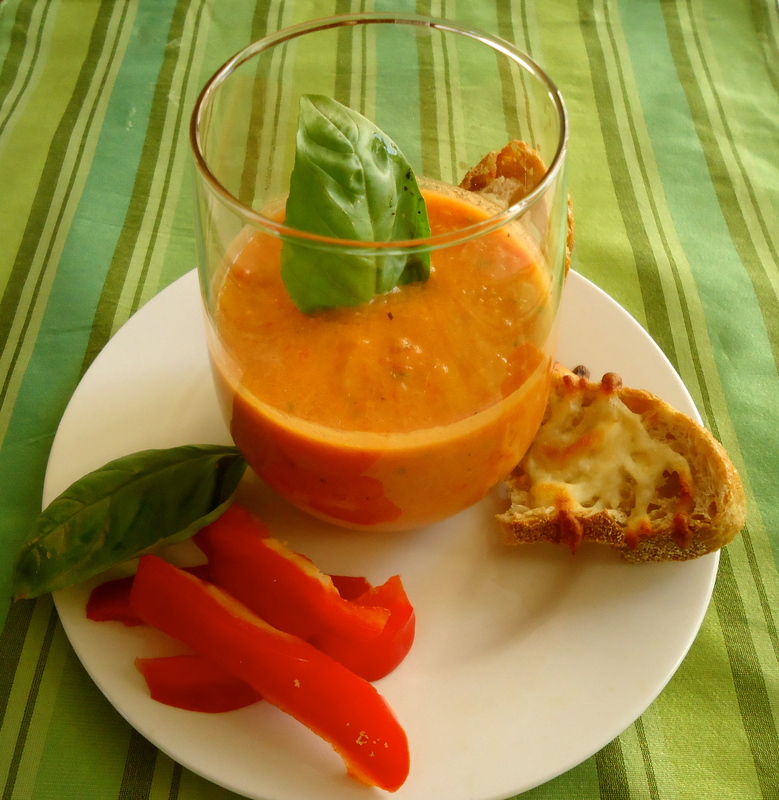 It is spring almost summer… and time to enjoy some fantastics cold soups… One of the stars of all is the Spanish Gaspacho! Olé!! Simply mixing in the right way the summer vegetables we all love, this soup can be bold or delicate like the land and people of Spain. 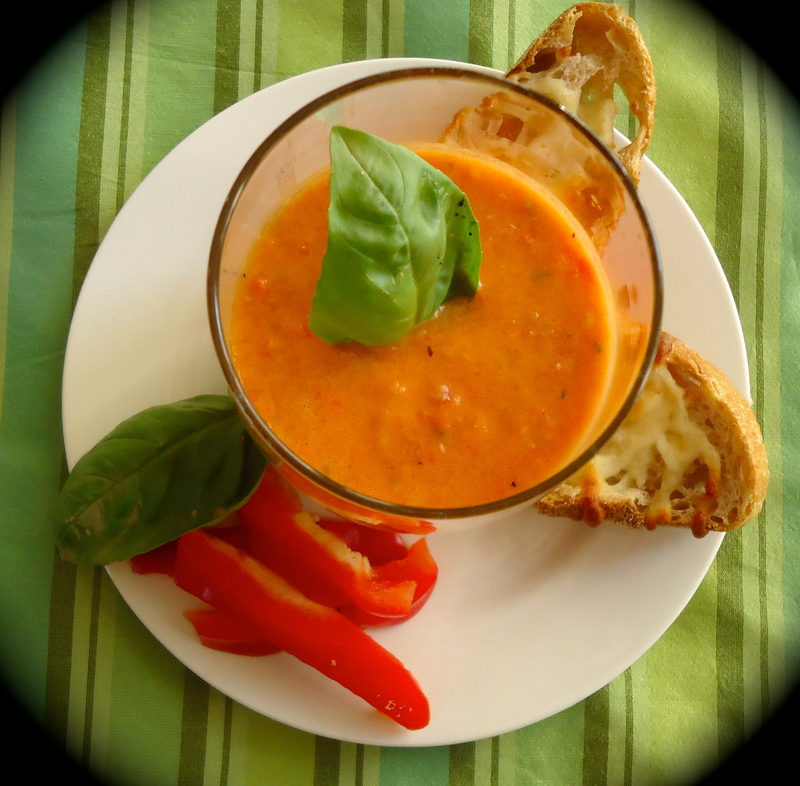 From Andulucia to Catalogna, gaspacho is an household classic with many versions Bread or not, jalapenos, chunky or smooth, meat or not, everybody can make it at his own taste, using fresh vegetables and fresh herbs with a pinch of fantasy !! Because I love all the Mediterranean flavors of the soup, we will have many other versions, after all, it is only 15 -20 minutes preparation, plus 1 hour into the refrigerator!! (minimum). This one is made with a beautiful red pepper I had on hand and some zesty garlic, a lot of fresh herbs from my new little herbs garden!! Wash, pat dry, seed, press and roughly chop small tomatoes, keeping all the juices and pulp in a bowl. Seed as much as possible the cucumber, chop and reserve, wash and pat dry, chop the pepper. If using jalapeno proceed in the same way. Cut and press the pulp of the tomato reserved for juice, then pass with all other reserved juices through a fine mesh strainer set over a bowl to obtain some tomato juice as much as possible. In a large bowl mix all chopped vegetables, fresh herbs, minced garlic, mix well adding salt and pepper. Working in batches place half chopped vegetables in a blender, pulse till the mixture is smooth yet still consistent with some small chunks, adding 1/2 olive oil, 1/2 vinegar and lemon and tomato juices. Place it in large glass bowl. Do not use metallic or plastic reactive bowls. Repeat with remaining mixture,olive oil, vinegar, lemon. When all combined in your serving bowl, mix well, add ice water, adjust salt and pepper, adding spices if you like. At the taste your mixture should taste like a pureed chunky flavorful salad mix with a zesty garlic kick!!! Place the bowl, covered with a plastic wrap into refrigerator for at least one hour to overnight. The longer the gaspacho is refrigerated more flavorful it will be. Serve cold with some warm mozzarella toasted bread, sprinkle with a basil chiffonade for garnish! Chiffonade: is a cutting technique for fresh herbs or leafy lettuce- In few steps, you hold a small bunch of basil leaves on one hand, roll it in a roll on the cutting board and cut with a long knife in thin slices, or like I do, over a small bowl, roll it and then with a pair of scissors, cut thin slices.. You will get some long strips out of the leave keeping all the flavorful herbal oils! !